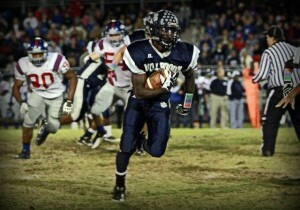 Raleigh’s Keith Marshall is widely regarded as the top running back in the class of 2012. At 5’11” and 180 pounds, Marshall has impressed coaches and scouts with his electrifying speed and quickness. Highlights of Keith’s junior year can be viewed here. After his impressive junior season at Millbrook High School, Marshall holds verbal scholarship offers from nearly every major college football program. Duke and North Carolina were two of the first schools to offer the elite running back, and he remains wide open at this stage in the process. My biggest strength are my speed, acceleration, and vision. I’m working on getting bigger and stronger so I will be effective between the tackles at the next level. BDN: What are some of the goals you have for yourself and your team this fall? My biggest goal is just to get better and it’s the same for my team. BDN: As you approach your college decision in general, what are the most important things you are looking for in a college? The relationship the players have with each other and with the coaches. I also look at the academic program. BDN: What schools have you recently heard from? Who were the first schools to contact you? What schools have you heard from the most often? I’ve heard from probably over 50 schools. The first schools to offer me were UNC, Duke, and Georgia. I hear from a lot of different schools on a regular basis so I can’t say who I hear from the most. BDN: Which schools have you had a chance to visit so far? Were there any schools you came away particularly impressed with? I've visited UNC, UGA, Clemson, South Carolina, NC State, Duke, Florida, and Alabama. I was impressed with all of them. I’m not sure yet but I know we'll be taking a lot of trips this spring and summer. I'll make my decision whenever I’m sold on a school and I know that’s definitely where I want to go. BDN: Is there anything else you think is important for ACC football fans to know about you? I have a 4.25 GPA and the fastest I’ve been timed at in the 40 is 4.25. BDN: Thanks a lot, Keith, and best of luck to you.